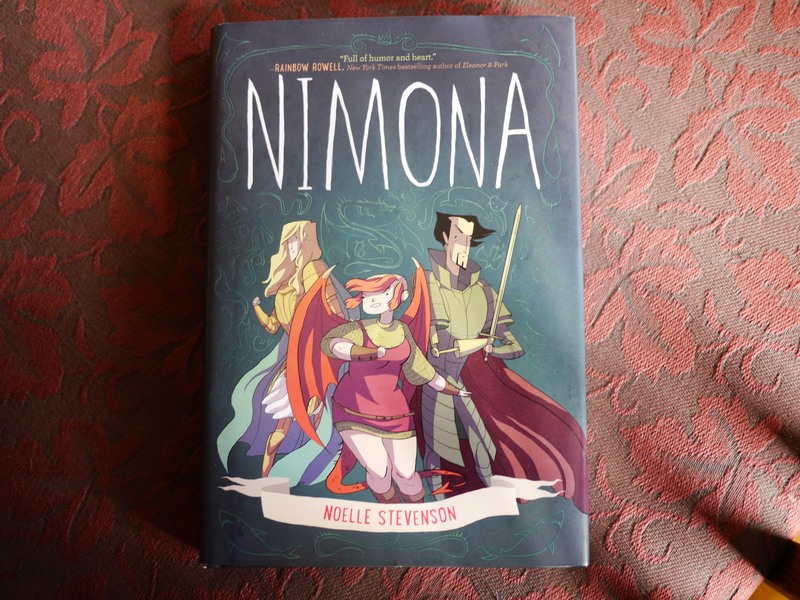 I first heard of Nimona when M told H about this web comic that she might like about a shape shifting girl and two scientist-knights. But I didn’t give Nimona much thought. Not then. Each Thursday, when a fresh panel was released online, H and M would talk it over in excited tones, wondering what would happen next, reviewing the clues in the panel, speculating on meanings and gestures, the things said and unsaid, shown and unshown. I didn’t love Nimona. Not yet. 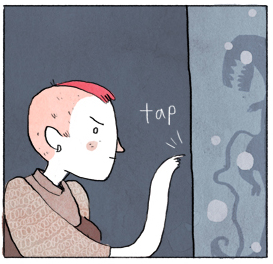 I fell in love with Nimona so gradually I didn’t notice it was happening. At first, she was just a name. Then she was a weekly anticipation. Then she was a story. A girl. A world. A weekly presence who brought laughter, worry, fear, “the feels”, speculation. Then she was a book. Nimona is a girl. We think. She has a murky past. She may be a monster. She may be a dragon. She may be a kid. She’s two dimensional, ink on paper, and somehow fully dimensioned. I fell in love with her hair. Her honesty disguised in lies. Her not taking the easy way. and then just walk away, after the important work was done. I fell in love with her heart. But, truly, I fell first for that tiny, delicate, insistent, pointed finger tapping on the door. Right then, I had the sense that she’d be wonderful, that she’d enter her own story and blow the doors off the place. We’d love to hear what you read this month! Since I’m posting late (again) this month, let’s set the next book due on November 14. See you then! This post is part of our multi-year reading challenge. We’d love to have you join us for the whole challenge or any portion. Take a look at the checklist to see the current category (in green). We’ll announce the next category on the 11th (more or less) of each month.